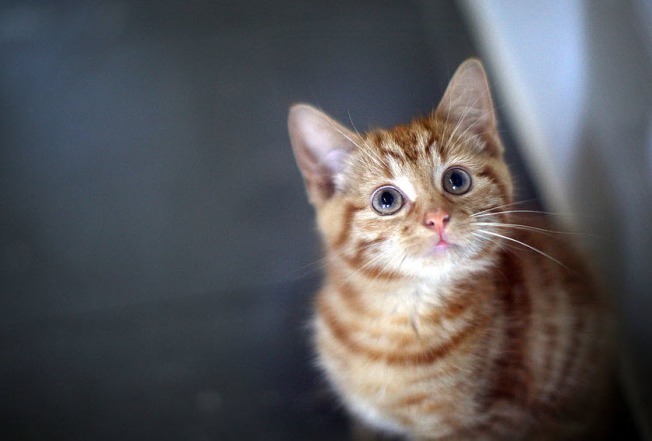 File image of a kitten. A kitten on Saturday needed some purr-suasion to get out of an unusual spot. The tiny feline spent more than 14 hours trapped inside the rear bumper of a Tesla Model X, according to the car's owner, Saleem Umar. Umar, of Boynton Beach, Florida, first spotted the kitten — since named Tessie — as he left work on Friday. Upon spotting the man, the cat fled under his car. Umar didn't pay much attention to the animal as feral cats are common in the area. Around 6:30 a.m. the next day, Umar went to his house's garage to grab something when he heard the kitten's plaintive meows. "We don't have a cat!" a baffled Umar told NBC Bay Area. He continued: "I assumed one of the neighborhood cats had gotten in our garage for shelter, considering it had been raining the past couple of days. My wife and I thoroughly searched the garage, all the while hearing faint intermittent meows. After clearing the garage, both of use began eyeing our Tesla Model X." The couple thought that Tessie might have climbed into the car's trunk. "I opened the rear trunk lid and falcon wing doors with the key fob, expecting an irritated cat to jump outside. Nothing. Yet the moews were still audible!" Umar said. Umar and his wife followed the sound — captured in a YouTube video — and were stunned to realize that it was coming from the rear bumper. Concerned for the kitten's life, Umar contacted Tesla's 24-hour assistance number. His case was flagged. "I drove as gingerly as I could to the service center, not wanting to scare Tessie more than she already was," Umar recalled. The mechanics hoisted the Model X onto a lift and a few technicians got to work right away. A second video shows a Tesla Service Center employee gently prying the kitten out of the car. "After about 30 minutes of removing parts of the rear bumper and undercarriage, locating exactly where Tessie was hiding with flashlights and inspection mirrors, and lots of coaxing, they successfully pulled Tessie out —healthy and unharmed, albeit quite shaken up," Umar said. The mechanics gave the cat water as soon as she was dislodged and one even offered to give Tessie a forever home, according to Umar. "Tessie, the lucky cat, ended up moving from the wild to a loving home through a crazy set of events, in a matter of hours," he said. It still remains unclear exactly how the kitten managed to squeeze itself into the cramped space. The adorable video caught the attention of Tesla's Chief Executive Officer Elon Musk, who posted it on Twitter on Saturday afternoon. His tweet has since been retweeted more than 2,200 times and picked up roughly 11,000 likes. The automaker's headquarters are located in Palo Alto.